At any given moment you have the power to say, “This is NOT how the story is going to end.” Join us today as we discuss the 5th and final step in reframing the chapters of your story that feel broken. Today we’ll put all the previous steps together to come to the final reframing of your story. Get ready to rewrite the broken chapters for good. Reframing is looking at a story or event in our lives through a different frame of understanding: hence, the RE frame. Often we are very stuck in our own interpretation of our stories, despite the fact, as we discussed in step 4, that there are many ways to interpret a situation. We see things only as we see things and it’s a process to discover other options. When I was doing the work to reframe my stories, I could not see another way to interpret the things that had happened to me. It took another person to help me see what I couldn’t see on my own. In our first week in Tunisia, during September 1966, we made our way, with great naïveté and some trepidation, into the hills of the romantic blue and white Mediterranean coastal town to negotiate a lease for this house with its owner, a shrewd old patriarch. We were served tea, our new language skills were tested, and the rent was agreed upon — exactly what the old man asked for. The house, traditionally built, was completely invisible from the street except for its tall, arched doorway and decorative door. Its rooms were designed on three sides of an interior courtyard. Its arched plaster ceilings, lavishly sculpted in plaster was hung with ornate crystal chandeliers, and the lower halves of the interior walls were encrusted with tiles set in colorful geometric patterns. Its 30-square-foot, marble-paved courtyard had its own well; its walls were tile-decorated and its windows to the interior rooms protected and ornamented in painted metal grill work. This was a space made for entertaining and displaying its ancient Muslim architectural tradition! Our first “reception” was a coffee and croissant breakfast for 80 to 100 people on Thanksgiving morning of 1966. Peace Corps volunteers from Massachusetts and California and those working in Tunis were invited along with the American Ambassador and other American officials to meet and greet young Senator Ted Kennedy and John Tunney, the boxer’s son and House of Representatives member, as they traveled North Africa. Back from memory to my 2010 journey: A taxi deposited us on the street. We walked a short distance and turned onto my narrow, unpaved street. I found the huge door at #14 and entered its dark corridor that led to our door. My heart was racing, my long-anticipated visit laced with fears that the house had been left uncared for and had fallen to ruin, that no one would be at home to answer the door, that my long-forgotten language skills would not be persuasive enough for us to be allowed in, or that the house, in reality, would not be as I remembered it. It felt strange for there to be so much light at the end of the dark corridor I remembered. I reached its end and turned right to knock on the door, but there was no door, just a gaping opening — the light was not from my fondly remembered courtyard. There was nothing there! What had been was no longer there and was, in 2010, an open field filled with three-foot-high weeds, some plastic bottles and trash. The outer walls were somewhat intact surrounding this weedy lot and on them were markings where outer wall arches had once been. Not a tile, not a remnant of plaster sculpture, not a piece of marble. There were no remains. When I returned home, my closest friend listened to my story. She said it reminded her of what concentration camp survivors must have experienced when they returned home after World War II to find their old reality gone, just a memory. This jolted me to begin to put my experience into perspective. My heart opened beyond myself. I felt compassion as I considered the many millions over centuries who have lost their homes and way of life because of wars and catastrophes as recent as those in Darfur, in the Gulf after Katrina, in Port-au-Prince after the earthquake, from tsunamis and floods all over the planet. The five steps of reframing your story allow you to step onto a path and start a process in a healthy and healing way, taking it one step at a time. It’s a process designed to specifically assist in dealing with our difficult stories. This final step: the reframe, is actually the combination of all the pieces you have created with the following four steps: If you have fully accepted, releasing any shame, your story to be what it is no matter how much you wish it was different. If you have claimed it and allowed it to be, then you are prepared to be able to tell it, out loud, in words, in a safe place. Saying it aloud, with less cringing, with the acceptance from the previous step, the story loses some of its hold on you. Bringing it into the light naturally does that. Once you have completed those two steps, and it may take a little time, you then start the work of finding the meaning behind the experience. With this meaning there is something beyond pain and disappointment that come from our most difficult experiences. We figure out what that is, and often the great power in this step is that we begin to see the strength and power, the growth and the beauty rise from the ashes. After step three when we can see some of the gold being sifted out from the dross, we move on to the fourth step, and maybe the most difficult, of taking apart our lenses and the truth about the way we interpret things and the ways others may have been interpreting events, and reconsidering that our interpretation is not necessarily fact, but that there are other ways and perspectives available and probable, and perhaps that understanding can help you find the new frame. 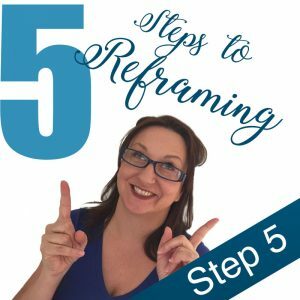 Step five is the process of putting them all together, getting clear on what your reframe looks like. From here, I suggest writing it down or recording it so that you can reset in your heart and mind. When you are trying to reprogram a long held story and carefully guarded story there can be great power in the process of rewriting it – flushing it out in the new frame, and in words rather than just ideas. Step five is taking all the previous work you’ve done and synthesizing it into the final reframe that serves you in a more productive way. For me, shifting from looking at my life as broken, because it didn’t live up to the expectations within my religious teachings, or within what felt like acceptable and respectable bounds culturally, me coming to peace with it because I could look at what I had gained and how that had made me better instead of broken, it changed everything. Instead of shame and embarrassment, there was acceptance and realization of the process of living – like the making of a pearl – when an irritant, an invader into the mollusk becomes covered in lacre, layer after layer, a valuable item of beauty is created. This frame allowed me to find an inner peace, to share my story more openly when needed, to accept myself and my life path rather than constantly wonder how in the hell I got here. Your reframe may be like Rachael’s where you gain an insight into life that deepens your understanding in deep and beautiful ways and helps to change the world through your efforts in new ways. It may be like mine where most important was the move to loving my story with all its broken parts as well as its extravagant blessings and joys. Your reframe gets to be what it is to you, but if it provides a way to love and accept your journey or yourself and moves you toward loving your story in any way, then it’s worth every effort, because the stories we tell to ourselves, about ourselves, determine who we become. Determine our own confidence, our own peace, our interactions with the world and the good we do. This work is important! I hope you have enjoyed and found value in these five steps. I would love to hear how the process goes for you, what you need continued guidance in, and suggestions and ideas you come up with during your process. Please go to www.loveyourstorypodcast.com and hit up the Contact Us page. We want to hear from you. And, stay tuned for coming episodes where we listened to you and are bringing in more stories, as told by those who lived them. See you in the next episode.